This simple question reminds me to be intentional about how I spend my time. It encourages me to work on my most important projects, instead of frittering away time on busy work or low value tasks. This question reminds me to take at least one step every day in the direction of my most important goals…those goals that will get me where I want to be tomorrow. Where do you want to be tomorrow? 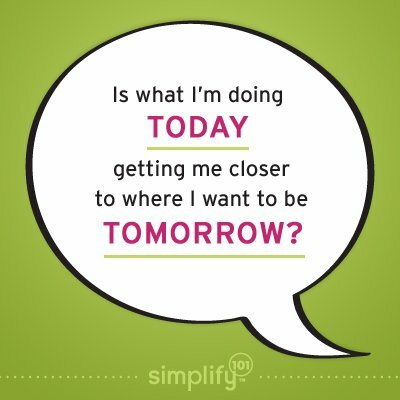 Is what you’re doing today getting you one step closer? I like this and will steal it. This post made me laugh because I have yellow sticky on my monitor saying “”Action makes it happen!”- Aby Garvey. What’s the next action?” Which helps keep me from Facebook and other mindless tasks at work and get into action. How fun that I’m stuck to your monitor, Alissa! Thanks for the reminder, Aby! One can’t go wrong with taking things one step at a time with intention. That’s right Cynthia! Nice to see you here! Hope you’re doing well. I stuck you to my computer too, seems I waste most of my time, no not waste, but I do go off track really easy, procrastinate is what I do, when I read this just now at the end of my day I realize that I didn’t get closer today:) to where I want to be tomorrow. Happy to be stuck to your computer! Hope today is a more productive day for you…and one that moves you a step (or two) closer! I have just saved this photo & now it is on my desktop – very motivating !! !